After the Marauders' doubleheader baseball game against Davis, Sharon, Jack, Jack's girlfriend and I went to the Sacramento Kings versus Phoenix Suns NBA basketball game. 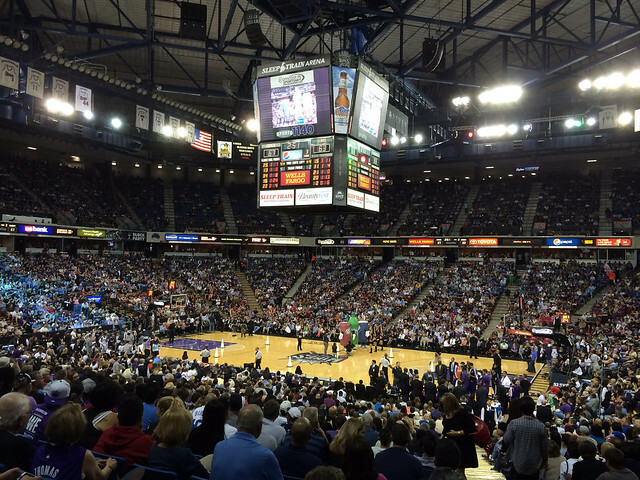 The Suns outscored the Kings 33 to 25 in the fourth quarter and won the game by the score of 104 to 99. It was the first Kings game that Jack's girlfriend ever attended. With DeMarcus Cousins suspended for too many technical fouls, the Kings were led by Ben McLemore. McLemore had 31 points on 9 for 20 from the field, 3 for 9 from three point range and 10 for 15 from the free throw line. Much to Jack's chagrin, the Suns were eliminated from the play-offs on Monday night. The Suns finished the season with 48 wins. Only the Suns and Golden State (2007-08) have won 48 games and failed to make the playoffs since the NBA went to the 16-team playoff format. With Goran Dragic sitting with a sore left ankle, the Suns were led by rookie Archie Goodwin. Goodwin had 29 points on 11 for 13 from the field, 1 for 3 from three point range and 6 for 7 from the free throw line. Goodwin had 12 points in the fourth quarter. I frankly don't enjoy watching the Kings are this point; it is just not a very good team. The Kings (28-53) matched their win total from last year and failed to make the playoffs for an eighth straight season. Sharon and I spent half time visiting with Hunter, Yuli, Snipes, Larkin and the Laskins.